That number would actually be over 80%, except that journalists are terrified to mention the perpetrators’ and victims’ race. 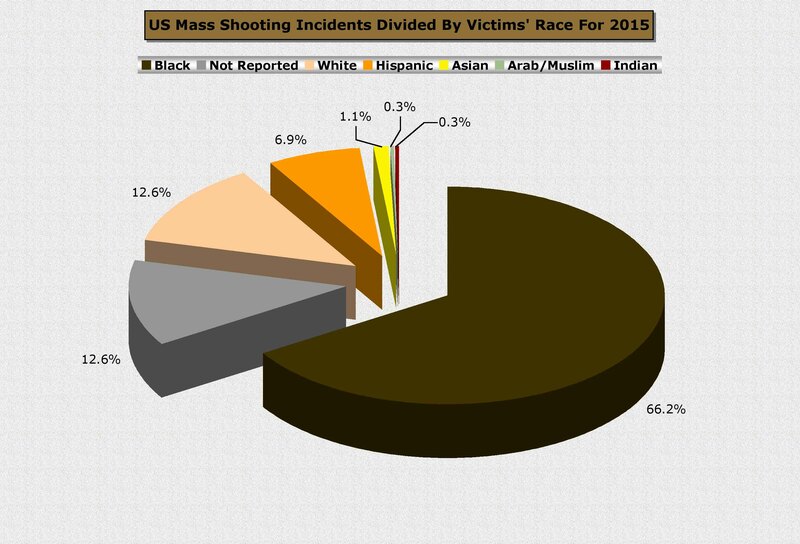 Up to 80% of the victims of mass shootings are also black. 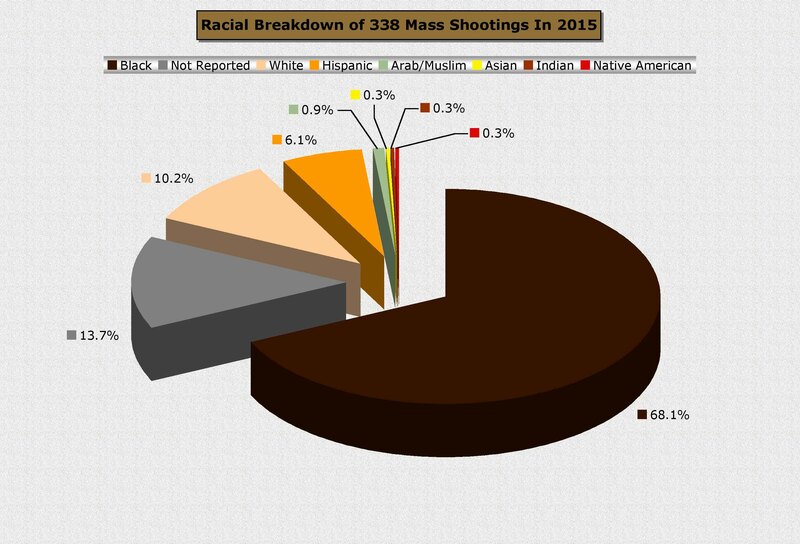 In other words, for the year 2015, of the 338 verifiable mass-shootings in America 90% were white-free. The myth that mentally unstable white men are the source of most mass shootings is simply false. Street crime, gangs, drugs and the like, accounts for 87% of mass shootings. In 60% of the mass shooting cases, despite plenty of witnesses, the perpetrators are never identified by police because of the “No Snitch” culture existing in the black community. Semi-automatic handguns are by far the weapons of choice. Shotguns and assault rifles are rarely used. Only 9% of shooters had a confirmed right to own a firearm, the rest likely obtained their guns illegally. Almost all the weapons recovered by police were stolen. 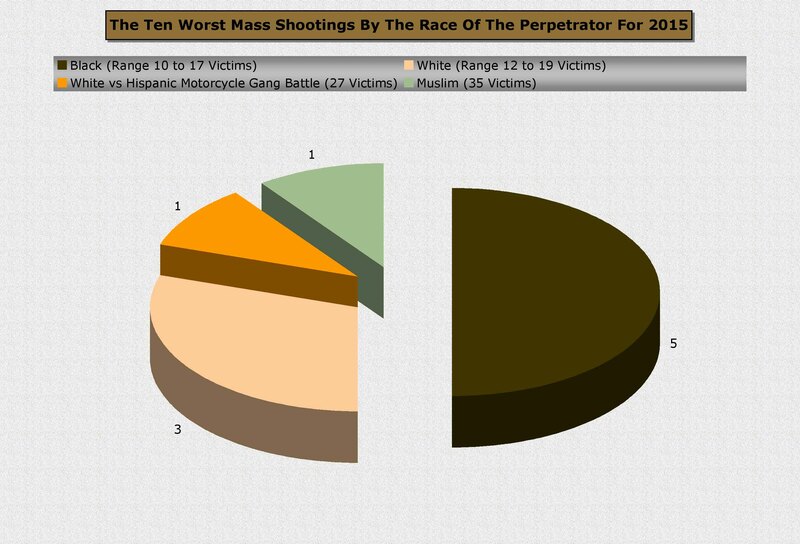 Mass shootings rarely cross racial barriers. Blacks shoot blacks. Hispanics shoot Hispanics, and whites shoot whites. 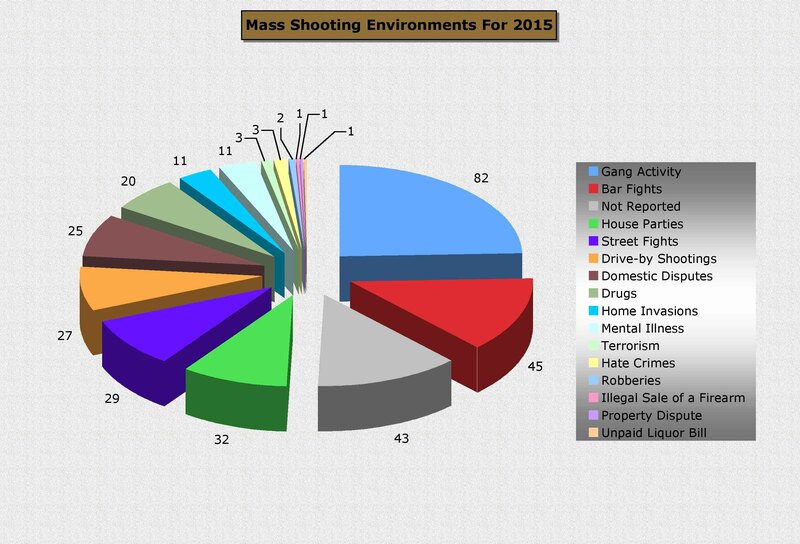 Mental illness, terrorism, and hate crimes combined accounted for only 5% of mass shootings. Of the three mass shootings that are classified as hate crimes, white males committed two and two Hispanic males committed one. Journalists are more likely to mention the color of the car involved in a drive-by shooting than the color of the shooter or victims. In 2015 America suffered a mass shooting, an event where four or more people are shot or killed, nearly every day. 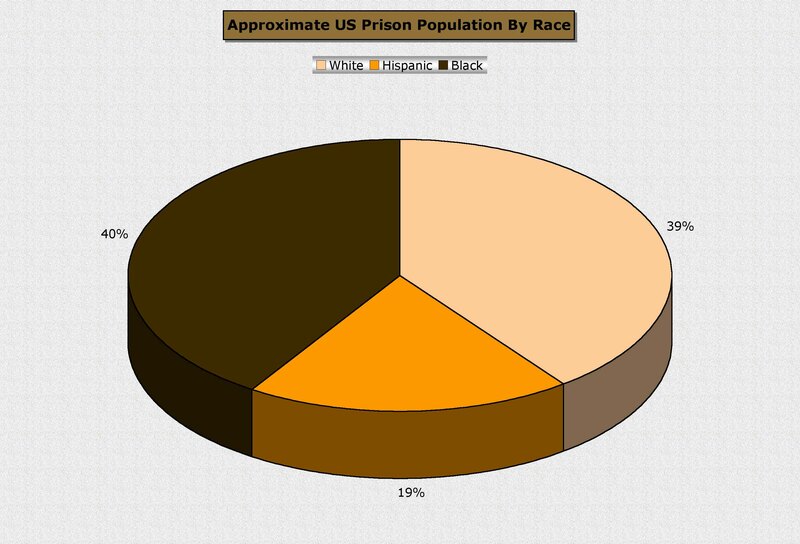 While America’s black community is disproportionately responsible for and affected by mass shootings, do not fall into the trap of believing that race plays a part in these crimes. Blacks are not genetically predisposed to random acts of violence. While modern black culture is certainly not doing itself any favors, the broader problem is global devaluation of the family. Family is the foundation of civil society. A man and a woman marry, rear children, and build a life within a community. Globally, birthrates for unmarried women are skyrocketing. An ever-increasing number of children are being raised in homes where there is no parent stability. Shack-up boyfriends come and go, mothers are either working all the time or on welfare, and the children are left to rear themselves. America’s black community, unfortunately for them, is at the forefront of this new global culture that has shrugged off the responsibilities of marriage and child rearing. 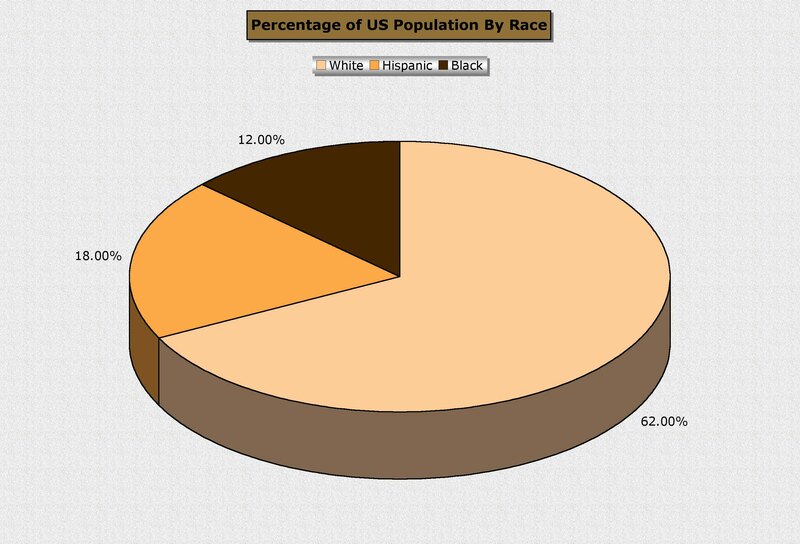 Well over half of all black American’s under the age of forty were born to unmarried mothers. 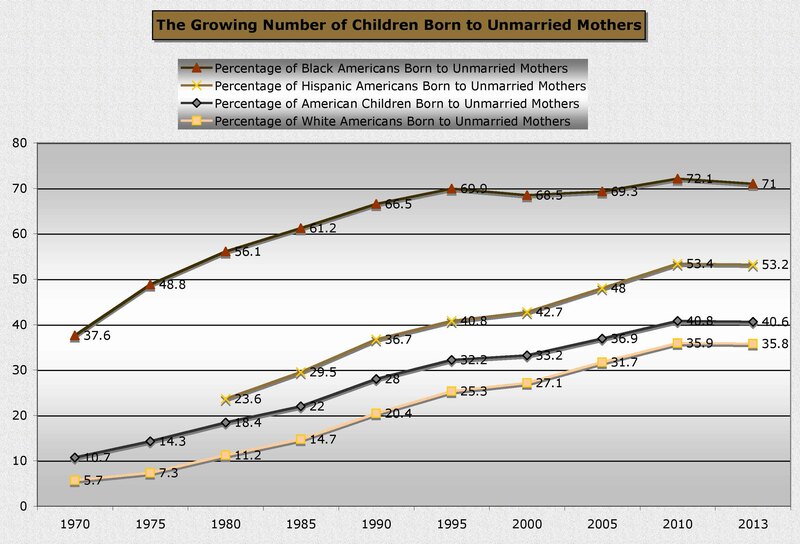 Almost 70% of blacks under the age of twenty-five were born to unmarried mothers. The rate for Hispanic children has recently gone over 50%, and white children are closing in on 40%. The number of American children born out-of-wedlock has nearly quadrupled since 1970. Family is where is all starts. Parenting is the single greatest responsibility most people will ever undertake. Children learn all they know about survival from their parents. Parents teach children that rules and laws actually have a valid purpose. Parents teach that respect for authority is actually important. Children glean wisdom from the experiences, successes and failures of their elders. 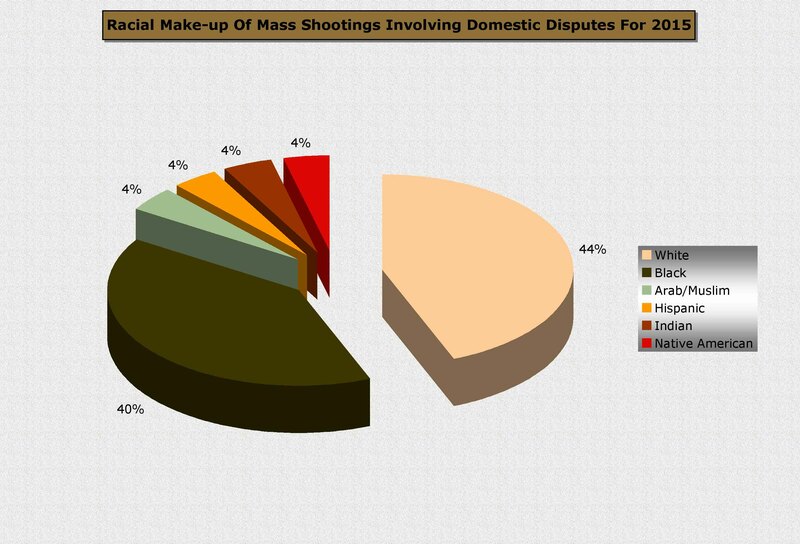 Of the 25 mass shootings that involved domestic disputes, 12 were murder/suicides. Parents supply a safe place for children with food on the table. For rich or for poor, it is every parent’s responsibility to use what tools they have to provide their child with a life as close to a Norman Rockwell painting as possible. My grandmother used to say, “I cannot help being poor, but there is no excuse for being dirty as long as you can afford a bar of soap.” She was a widow with five children at the height of the Great Depression and did not have two nickels to rub together, but she kept a neat, tidy home and made darn sure her children went to school with food in their stomach so they could learn. Mothers and fathers are supposed to help sons and daughters navigate the difficulties of childhood and adolescence so they can safely reach adulthood. When parents abdicate those responsibilities, something else will fill that void and that something is all too often gangs and crime. 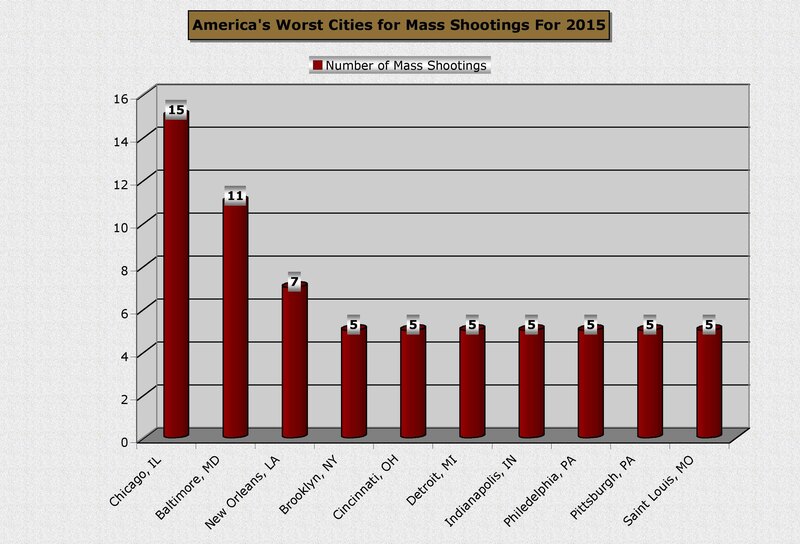 While radical Muslim terrorism accounts for the worst mass shooting of 2015, most of the time it is gang warfare. Instead of being stranded on a deserted island, as in William Golding’s Lord of the Flies, these children find themselves surviving a hopeless existence in a lawless urban jungle. They band together in roving gangs that live by the feud and die by the feud. They terrorize their neighbors, stay out to all hours partying with illegal drugs and alcohol, and they fight amongst themselves, wantonly killing anyone for any perceived slight. Most have criminal records by the time they reach the age of majority. They take their battles to concerts, to city parks and playgrounds, shooting babies, pregnant women, the elderly, and anyone else standing in the way of their vendetta without so much as a second thought. Collateral damage means nothing to these young men and they use a form of urban terrorism to silence those who would testify against them. 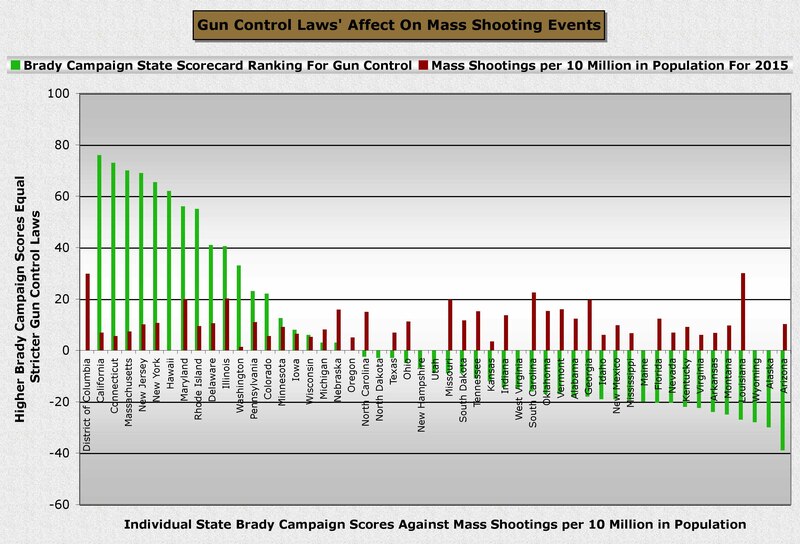 “The mission of the Brady organization is to create a safer America for all of us that will lead to a dramatic reduction in gun deaths and injuries.” They rank each state for the quality of their guns laws. President Obama’s solutions, such as blocking legal sales of firearms to people on the government’s “No Fly List,” criminalizing the private sales of firearms, and authorizing friends and family to put a “mental health block” on the legal purchases will do nothing to stop this problem. There is not a country on Earth where criminals are not well armed, no matter the law. If President Obama really wants to stop mass shootings, he should start by going home to Chicago and holding a peace summit with all the black gang leaders. He should hold up his own family as a shining example of how love, marriage, education and good parenting can stop the cycle of hopelessness and violence. Otherwise the solutions will fail and the cycle will continue.